TruFLEX® Dual Color Dual Converters install in line with the single red power from the Custom Dynamics® Dual Color TruFLEX® LED light strips to convert it from single intensity (i.e. Brake Only) to dual intensity (i.e. Run/Brake) while the Amber LEDs provide turn signal function. Can also be used with Custom Dynamics® Dual Color 2 Section TruFLEX® LED light strips. Low intensity (running) illuminates at 30% Intensity while high intensity (brake) illuminates at 100% Intensity. 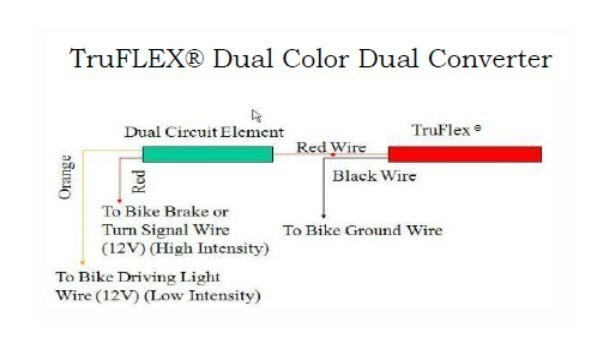 Select the TruFLEX® Dual Color Dual Converter based on the number of LEDs. Use in conjunction with Custom Dynamics® Dual Color TruFLEX® LED light strips to convert it from single intensity (i.e. Brake Only) to dual intensity (i.e. Run/Brake) while the Amber LEDs provide turn signal function. Can also be used with Custom Dynamics® Dual Color 2 Section TruFLEX® LED light strips.